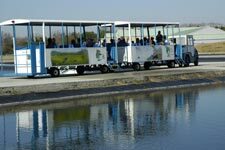 A free, narrated tram tour takes visitors through the outdoor hatchery facility. At various times of the year the 45 lined ponds, ranging in size from one-quarter to two acres, may contain channel catfish, largemouth bass or koi carp raised to provide food for the bass. The tug used to pull the tram cars is military surplus equipment that was once used to move planes on aircraft carriers. The artwork on the sides of the cars was painted by Ben Barrera, a TFFC employee who assists anglers at the Anglers Pavilion. Our tram tour ends at the Fly Fishing Pond and Pavilion. A duck blind overlooks the pond, and restrooms are located across the boardwalk. Visitors may disembark here and walk the Wetlands Trail or return to the Visitor Center on the tram. The Fly Fishing Pond and Pavilion are used for special events such as Fly Fish Texas and Outdoor Fools Day and for group instruction (by reservation only). See the calendar of events.